Last weekend we went up to Liverpool to see the Picasso exhibition that was on at the Tate. I was really looking forward to it as i felt that it would be such a privilege to stand in front of some of the most famous pieces of art the world has ever seen, and painted by a man who was so much ahead of his time. I was not to be disappointed as the standard of the work was amazing. The exhibition was called ‘Peace and Freedom’ and it focusses on the post war work that he did ,campaigning for peace.There were more than 200 of his painting,with key paintings relating to war and peace from 1944-1973,alongside a wide range of contextual materials.The centre piece was a painting called ‘The Charnel House 1944 – 45, which was Picasso’s most explicitly political painting since Guernica 1937.It was a very powerful piece of work in itself, but i also loved the way that it had an ‘unfinished’ look about it, where the top part of the painting was merely in outline, and the detailed sections were in the middle and at the bottom – this really controlled the movement of the eye, drawing it down to the base of the picture where the main message was.The subject for the painting was that it was based on a short documentary film about a spanish republican family who were killed in their kitchen, and Picasso who had lost many of his family and friends in the war used this painting to show his mourning,mourning his family – the spanish people. 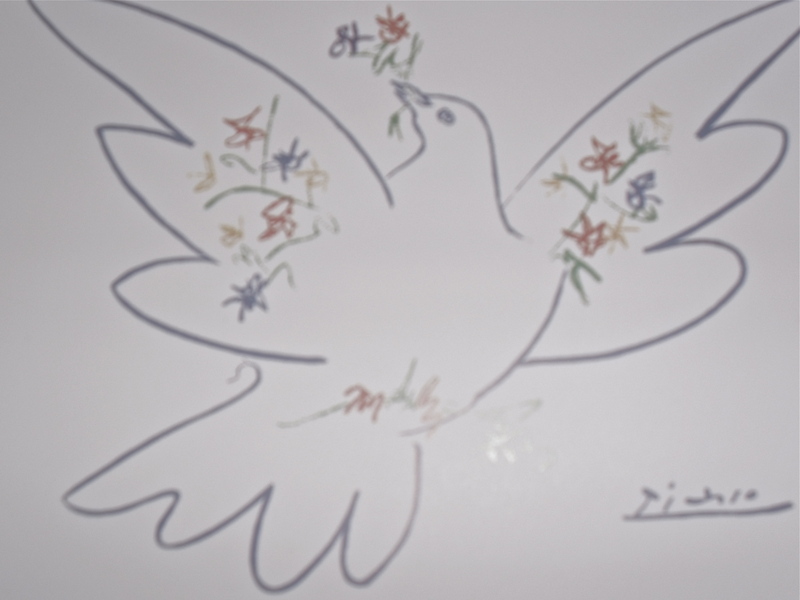 At the exhibition there were many paintings that contained one of Picasso’s doves of peace.He initially drew these doves for the Paris World Peace Movement in 1949, and it became their official logo. I just loved the power and simplicity of the image.Also in the same year his wife Francois gave birth to his fourth child that they called Paloma, which means dove. Although a man of small stature i feel he was a man of great personal strength and character.This can be seen when during the war the German occupiers tried to win him over with the offer of extra food and coal (to get him to stop creating propaganda that was damaging their reputation) and Picasso’s retort was to decline it saying ‘Spaniards are never cold!’….amazing!!! i walked away from the exhibition very aware of the power of art, and the image, and the impact it can have on the audience that sees it, this also made me aware of the responsibility we have as artists, designers, writers etc, to make sure that the message we portray is indeed to one we truly want people to hear, and to also not miss an opportunity to be able to create great change wherever we can!